Trisha Jeffrey and Mike Boyce. This was Trisha's first Lehman College show. It was directed and choreographed by Michiyo Tanaka, the book and lyrics by Michiyo Tanaka and Mike Boyce, and the music by Michiyo Tanaka's husband Katsuya Kuwashima. Trisha played Andrea and Mike Boyce played Jason. According to Trisha herself, "I played the lead role of Andrea, who yearned for her home life back in San Francisco, meddling with love, aspirations, drugs and pain, getting lost in the life of NYC." The following is an excerpt from a newspaper article dated Saturday, September 27, 1997. Lehman College's Lovinger Theatre presents "Forty-ninth Street Blues," from Wednesday, September 24 to Sunday, September 28. Originally from Kamakura, Japan, Tanaka is dancer and choreographer well-known in San Francisco and New York, where her works have been performed at Lincoln Center and Symphony Space. At Lehman, she's directed productions of "West Side Story" and "Hair." 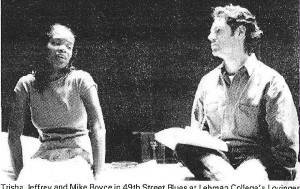 "Forty-ninth Street Blues" is the result of the collaboration with composer Katsuya Kuwashima and writer/lyricist Mike Boyce.